Educators, parents, and leaders want youth to develop the necessary social, emotional, and academic competencies to be productive and engaged citizens. Recent research has demonstrated that when schools and districts focus on social and emotional learning (SEL), students’ academic achievement, prosocial behaviors, and positive attitudes improve, while their behavior problems and emotional distress decrease. In addition, focusing on social and emotional development can help create safe, supportive, and equitable learning environments, both in school and in out-of-school settings. Strategies for promoting SEL can be embedded throughout instructional time. SEL is not simply a strategy for youth. Educators can also learn to improve their social and emotional competencies. For example, educators who practice self-awareness and stress management can more effectively model and encourage these behaviors for students. In addition, educators who apply and reflect on their own SEL skills build a more welcoming environment for youth. Explore these selected resources, tools, and reports to discover our research and technical assistance on SEL practices. Together, these resources demonstrate how SEL can contribute to a well-rounded educational setting and improve the conditions for learning for both youth and educators. Social and emotional skills and competencies are essential for young people to succeed in school, work, and life. In the past decade, there has been an increasing number of studies, systematic reviews, meta-analyses, and syntheses that focus on the key role that social and emotional learning (SEL) plays in the success and well-being of children and youth. 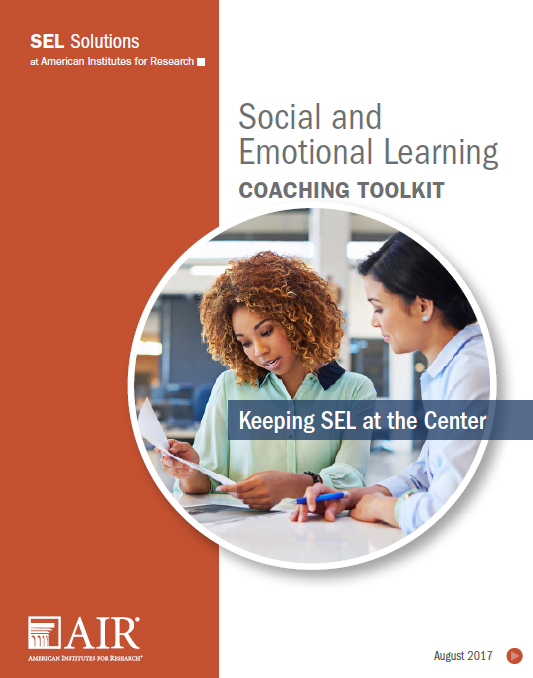 AIR, supported by the Robert Wood Johnson Foundation, designed and executed two related activities to explore and describe SEL for practitioners and researchers. What does social and emotional learning look like in practice? Specifically, what can district and school leaders do to promote it? In this 75-minute webinar, co-hosted by AIR, American Youth Policy Forum, the Collaborative for Academic Social and Emotional Learning, and the Washoe County School District, audiences heard from a panel of researchers and practitioners on ways in which districts and school leaders have implemented a coordinated and purposeful SEL effort. Social and emotional learning (SEL) develops people’s ability to make successful life choices, to achieve academically, and to be college and career ready. In this video, Nick Yoder explains how SEL can help students and what research says about its effectiveness.